The first joined large assemblies on the bench. 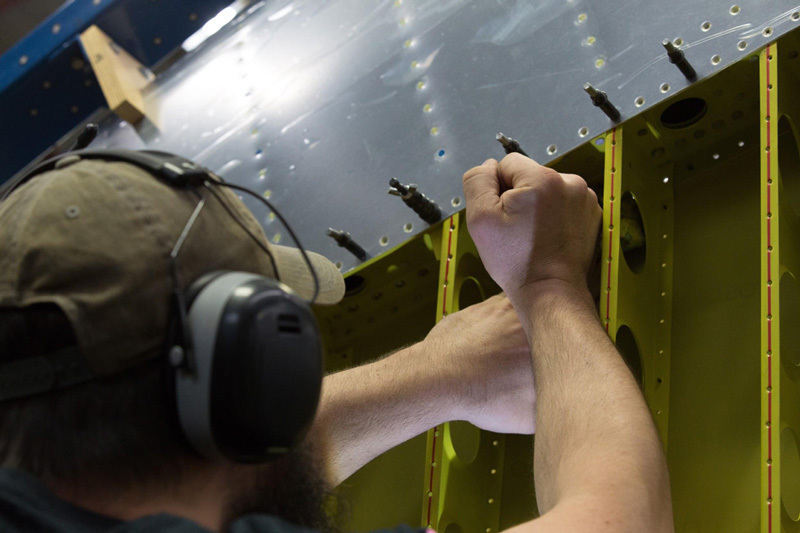 In October and November, for the first time we began some assembly of the major components of the airframe. 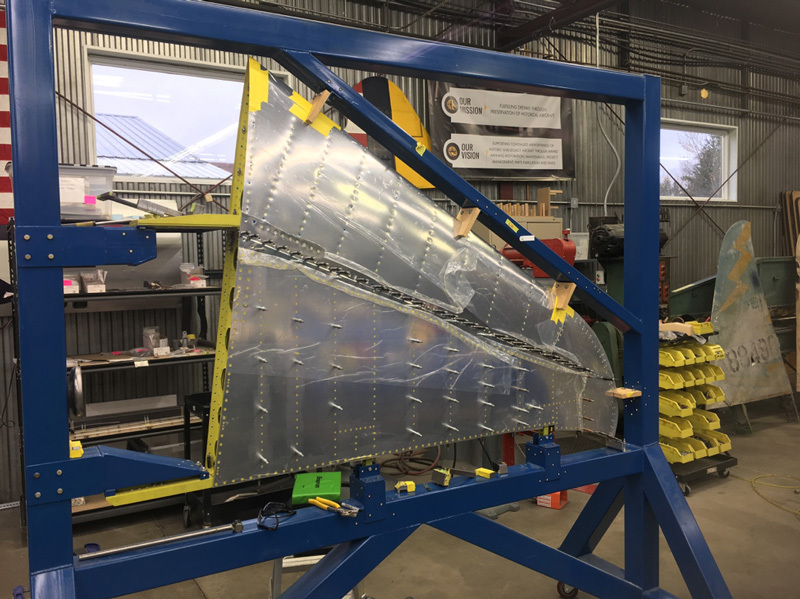 Other work on the P-47 this month centered on parts fabrication, disassembling the veteran fuselage, beginning the new fuselage, and assembling the fixed tail surfaces. P-47 RazorbackThese two are fume seal pulley brackets, tail wheel uplock part number 89M42212. 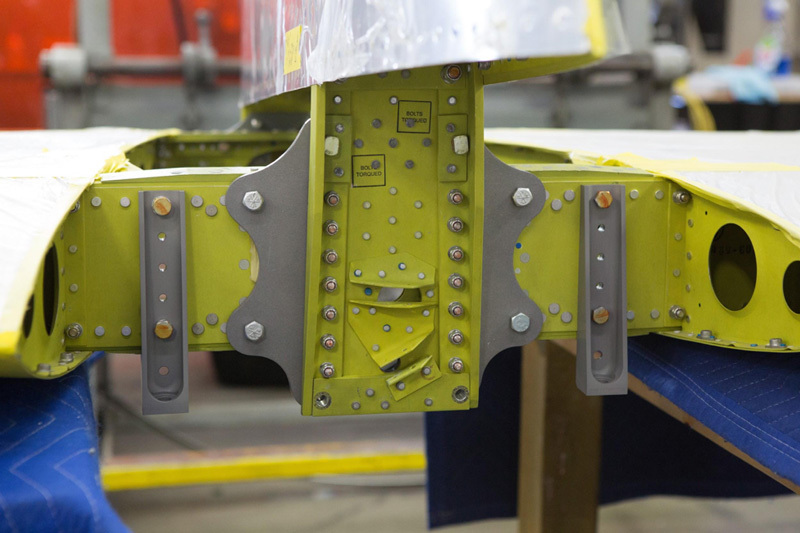 That means they cover the tail wheel uplock pulley bracket to seal off fumes from reaching the cockpit. 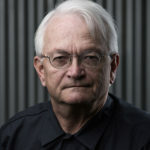 In a Thunderbolt, exhaust gas fumes in the ducts back to the turbo supercharger and fuel fumes in the high pressure induction duct running back to the engine can present a problem not common in other fighters. A great deal of engineering went into keeping those fumes where they belong and safely away from the pilot. P-47 RazorbackHere are a few parts that are ready. 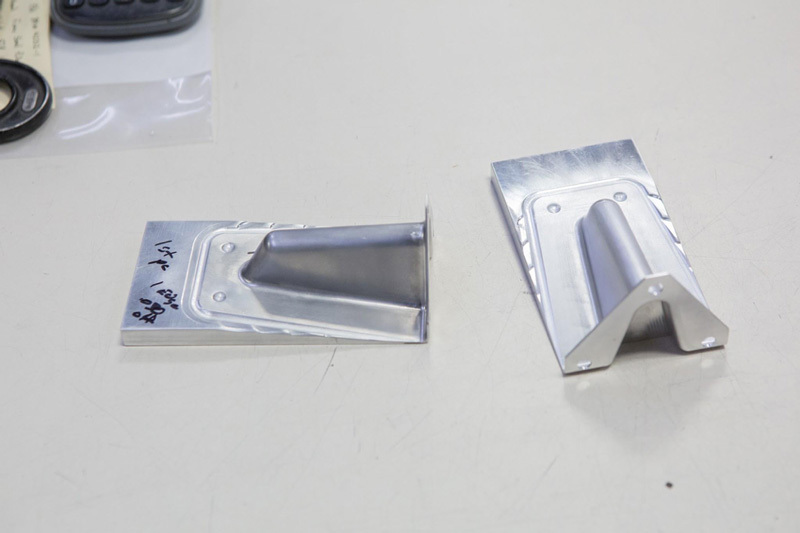 The packaged parts are cowl flap rod guides. Parts fabrication continues as assembly goes on. P-47 RazorbackSome control system related parts both new and patterns are visible on this shelf. 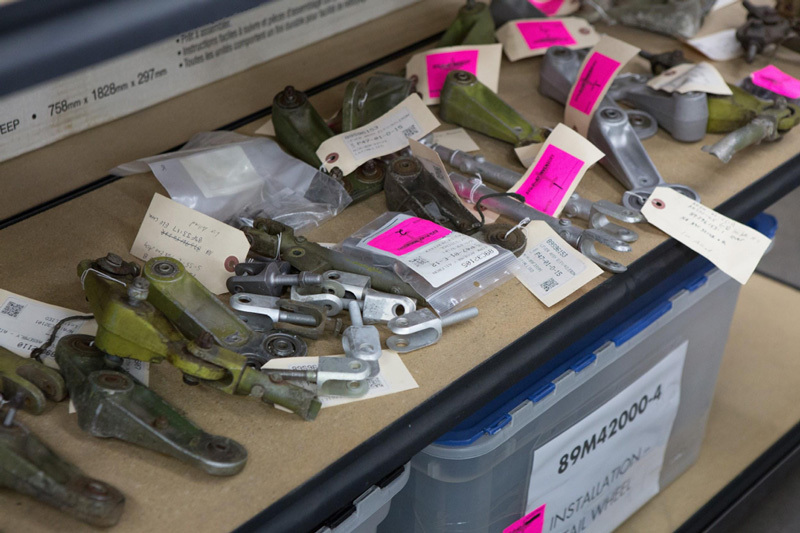 A few of them are the aileron differential fork assembly, elevator rod assembly, and right elevator control lever assembly. 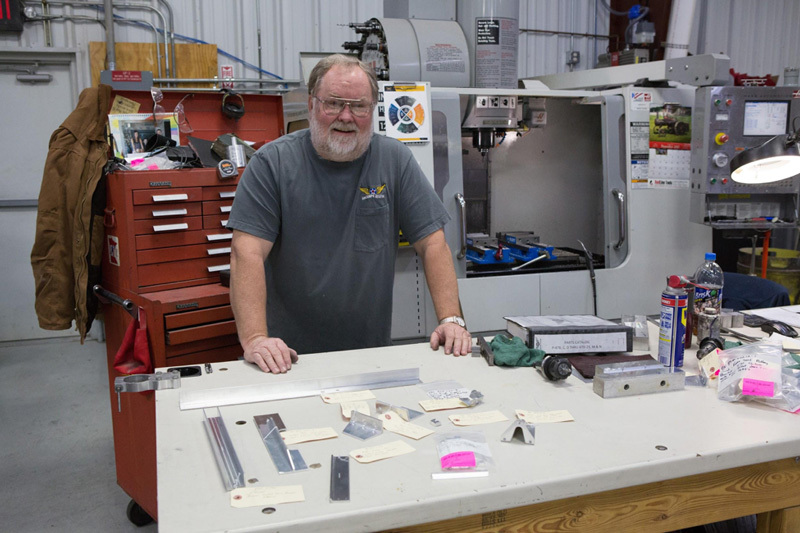 P-47 RazorbackSteve and the CNC mill where many of the parts are fabricated. 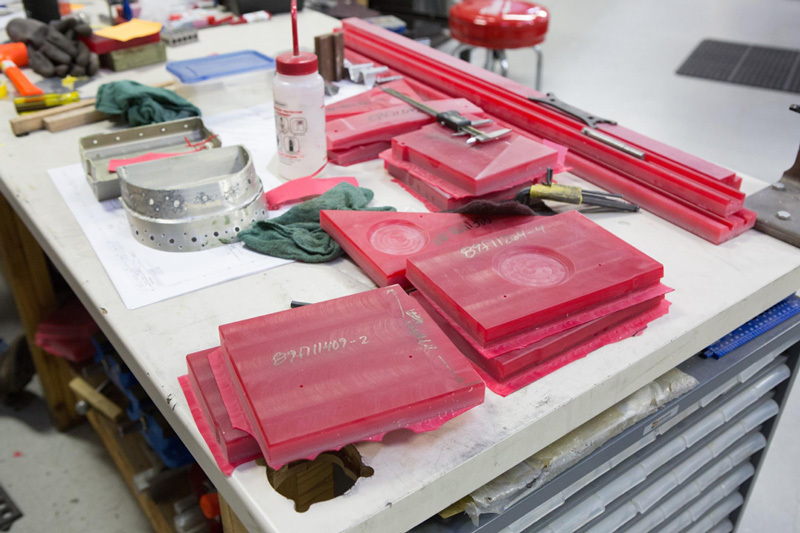 P-47 RazorbackMachined plastic forms for some of the fuselage components will be used as the aluminum is press formed over them to create the part. 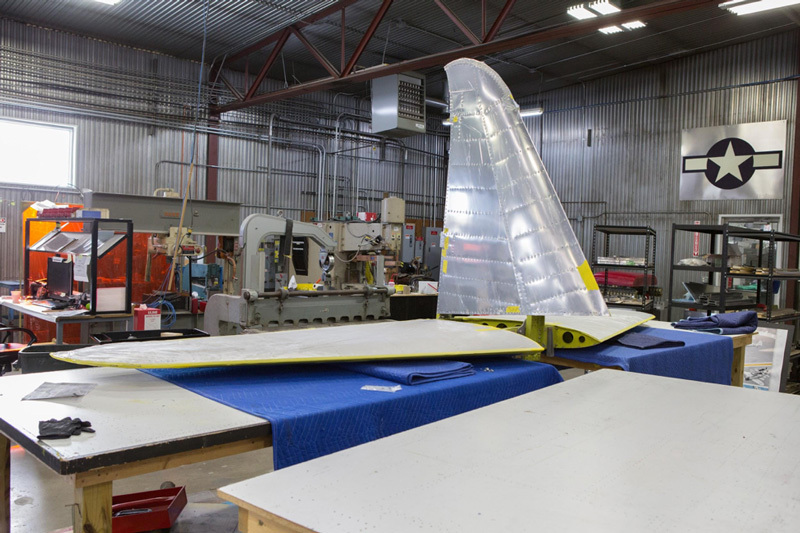 The forms with the two visible part numbers are for a fume-proof baffle and a diaphragm in the fuselage. Both are part of the design that is intended to prevent fuel fumes from reaching the pilot. 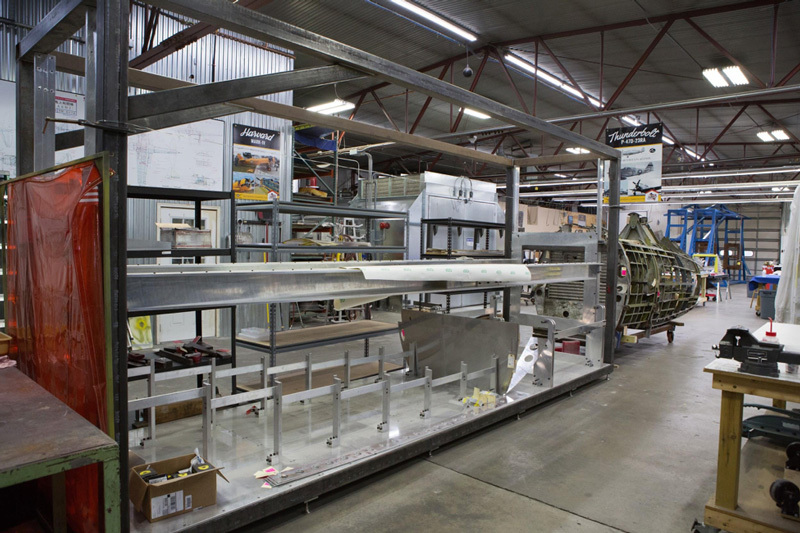 P-47 RazorbackThe fuselage frame sits on a rolling stand. P-47 RazorbackThe upper forward section from the rear of the cockpit to the firewall is shown here. P-47 RazorbackHere is a closer shot of the upper forward fuselage at the firewall end. 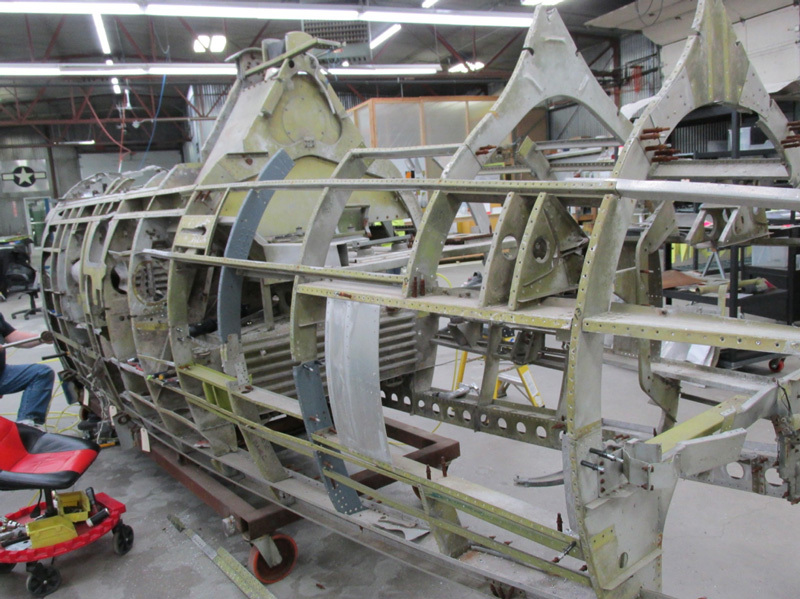 P-47 RazorbackThe war veteran fuselage serves as a reference beside the fuselage fixture. 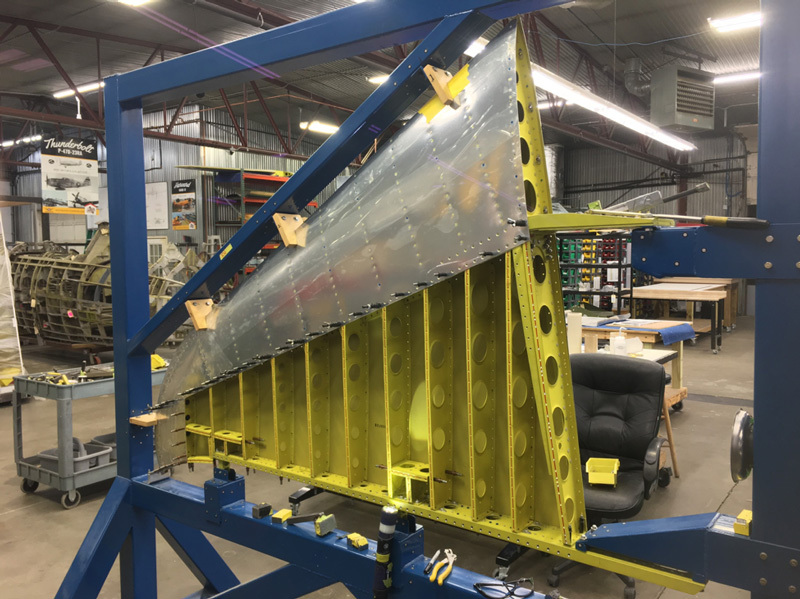 The vertical stabilizer skins were riveted on permanently this month. The horizontals skins have been permanently installed for a while now. 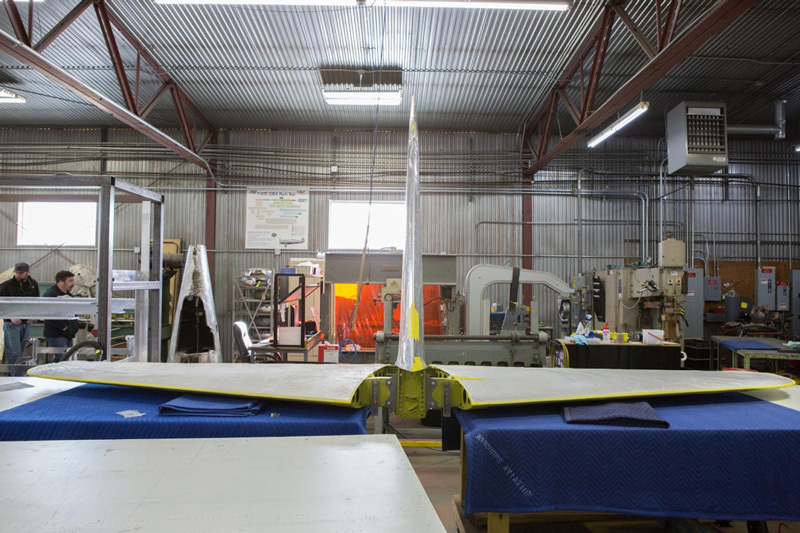 Once both were skinned, they were assembled -the first large, identifiable Thunderbolt parts to be put together! 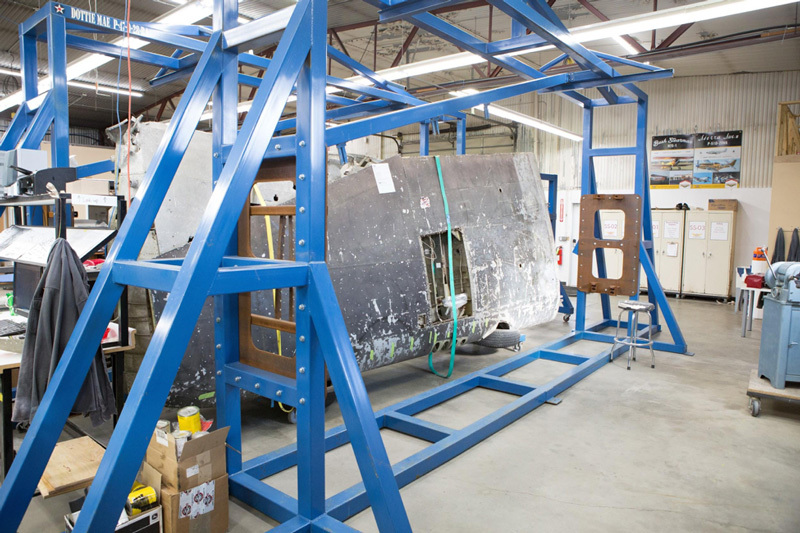 P-47 RazorbackRandy works on fitting skin sections to the vertical stabilizer. 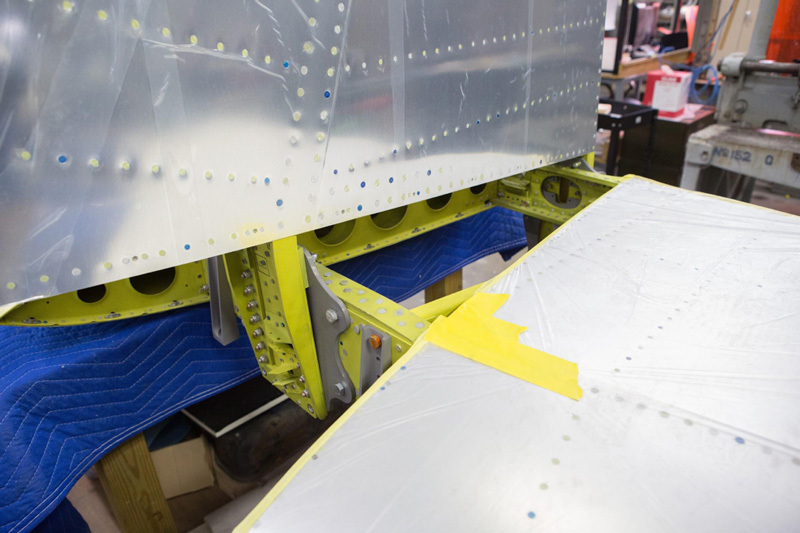 P-47 RazorbackMuch of the riveting on the leading edge skin has been completed here. 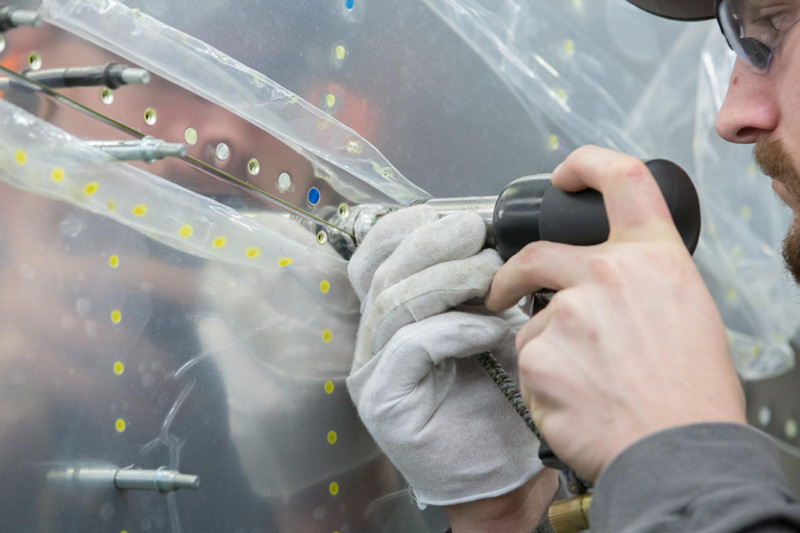 P-47 RazorbackThe mill surface of the AlClad skin is protected with plastic as fitting and riveting proceeds. P-47 RazorbackHunter sets a rivet in the vertical stabilizer. 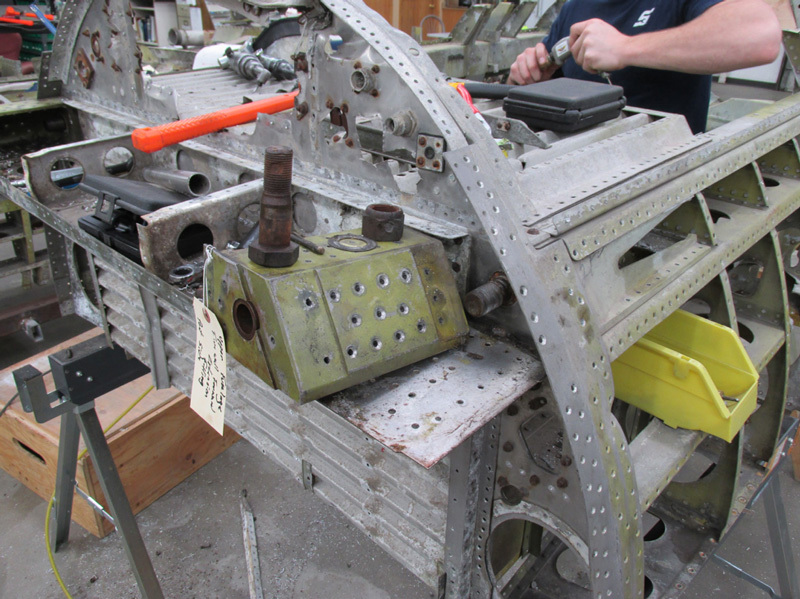 P-47 RazorbackThe wing fixtures have been brought onto the restoration floor. P-47 RazorbackA nice shot of the structural connection between the vertical and horizontal stabilizers. 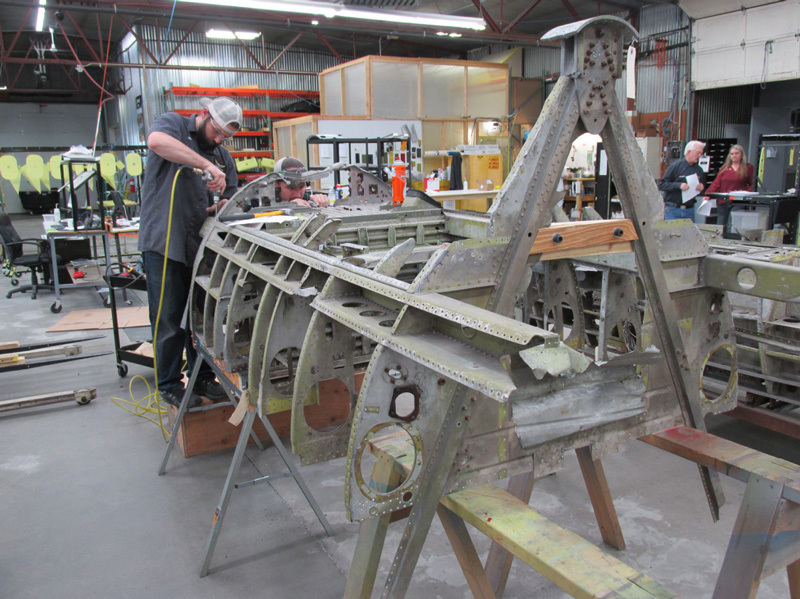 P-47 RazorbackA closer image lets us see the bolts and rivets used to affix the spars together. 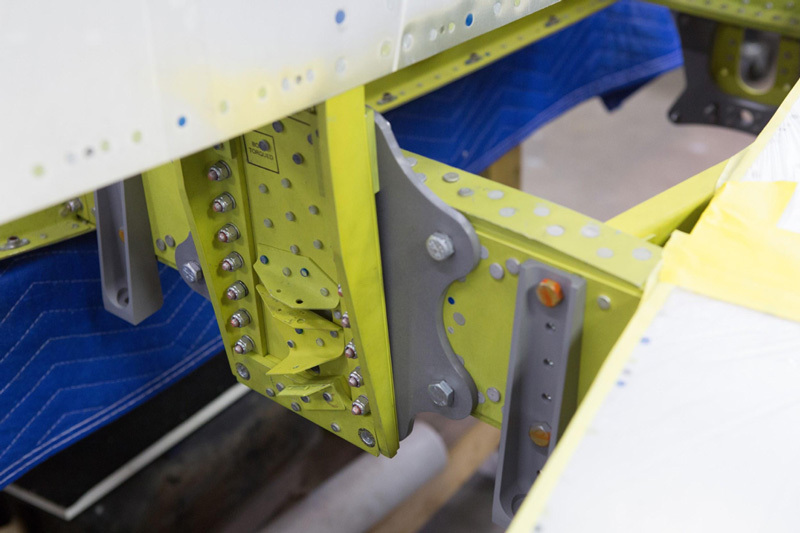 The gray forgings that protrude beneath the stabilizer are the forward fittings that are used to attach the empennage to the fuselage. P-47 RazorbackThe drilled brackets riveted to the spar will hold pulleys that are part of the trim tab control cable system. 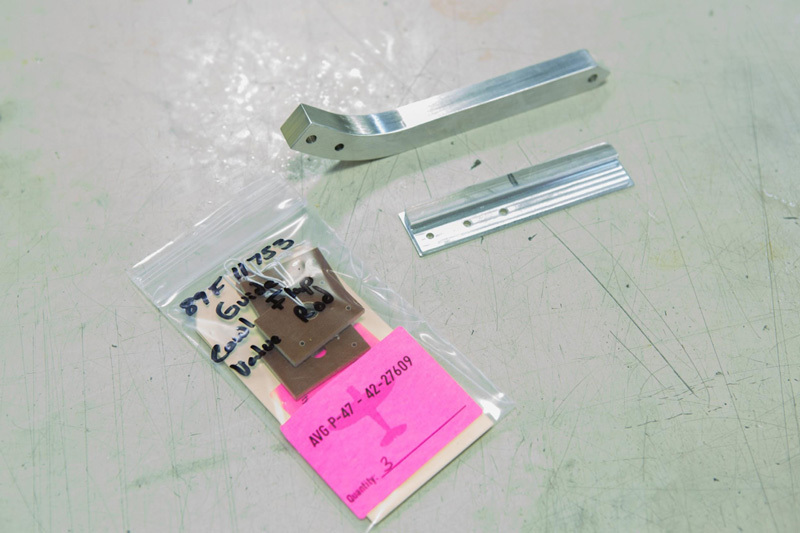 The majority of the horizontal spar is one of the original usable parts from 42-27609. 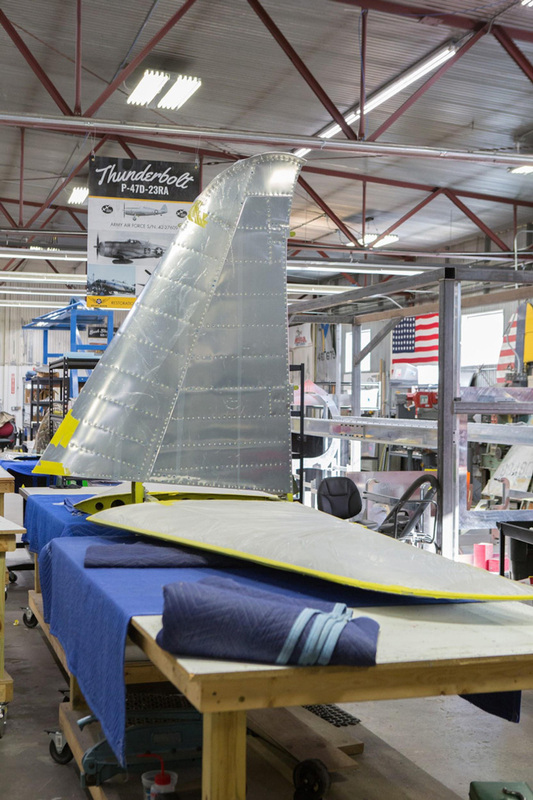 P-47 RazorbackThe horizontal and vertical stabilizers assembled on the bench. P-47 RazorbackHere we have a front view of the assembled components. My alumni magazine alerted me to your fabulous business. I live in Northfield MN. and have a hunting-fishing cabin 60 miles N of Bemidji, so I don’t get up there that often. If I stop by on a trip north, will I be able to see anything without a guided tour? Thanks! Friday afternoons are reserved for tours. You can call our office to setup a time. I’d love to work in a shop like yours! 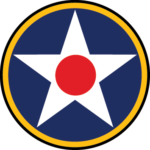 I’m currently in Aviation Maintenance School and will graduate in March 2019. I’ll also be helping a very good friend of mine restore his TBM Avenger.